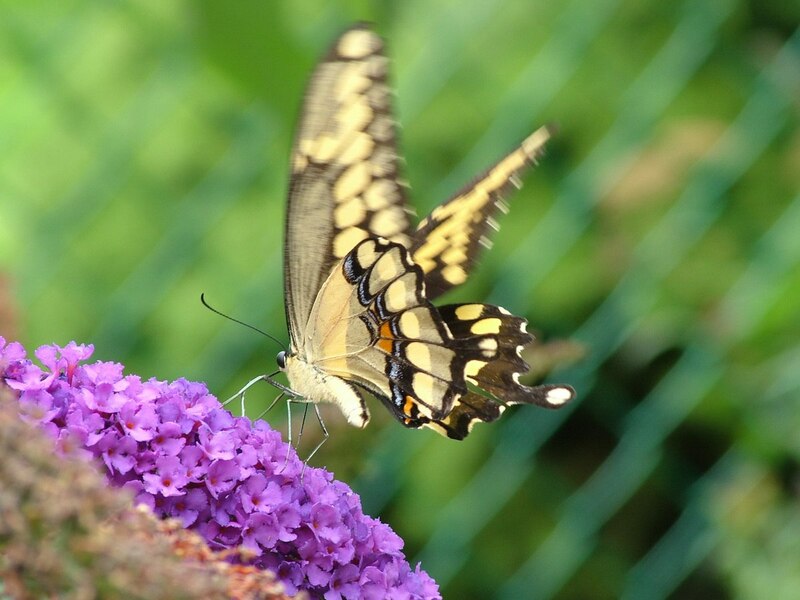 Years ago, I planted a Butterfly Bush (Buddleia) in my front garden in the hopes of attracting butterflies to my property. 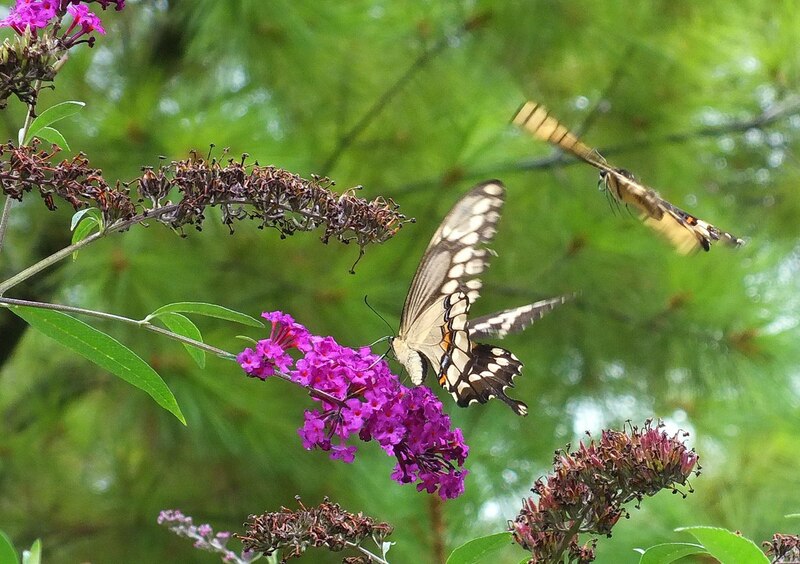 I never imagined that one day I would be seeing, not one, but two Giant Swallowtail Butterflies (Papilio cresphontes) cavorting amongst the branches of the plant. 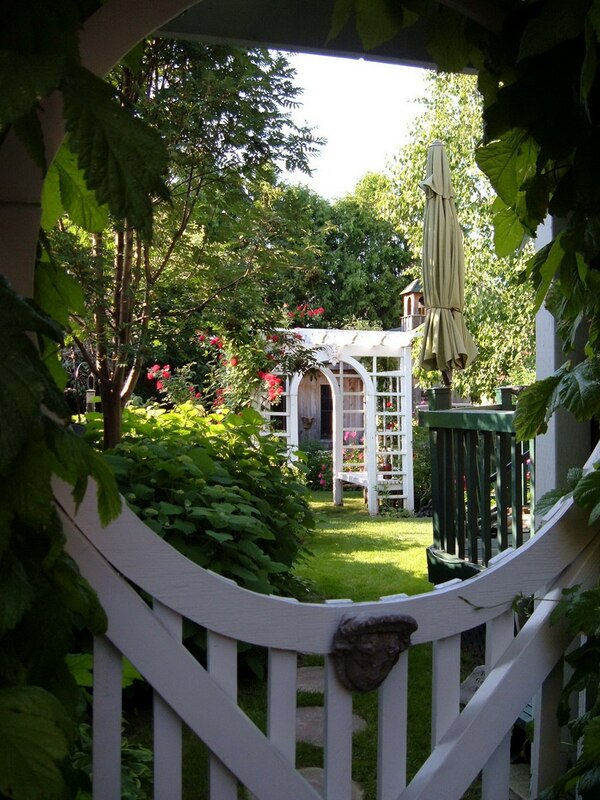 My garden is my pride and joy (after my children, of course), and over the years, it has evolved from a green space outfitted with a sandbox and swing set, to my secret garden complete with Victorian arbours, a swing gate, charming garden house and a babbling water fountain. 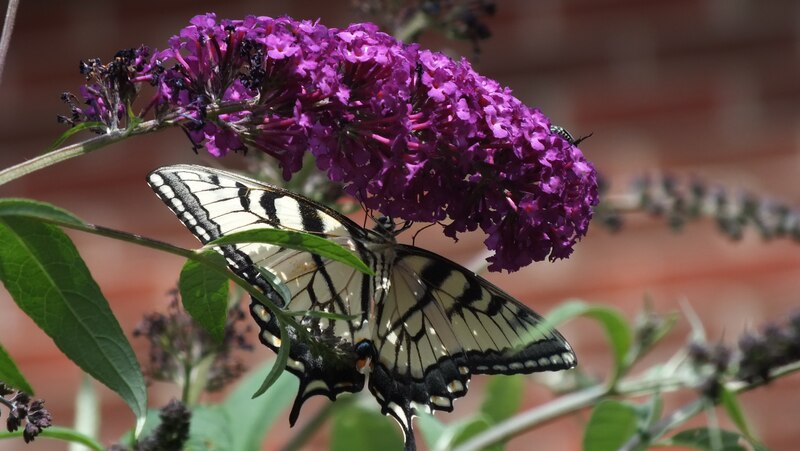 I was so successful with my first Butterfly Bush, that I have subsequently planted another two. The more the merrier. 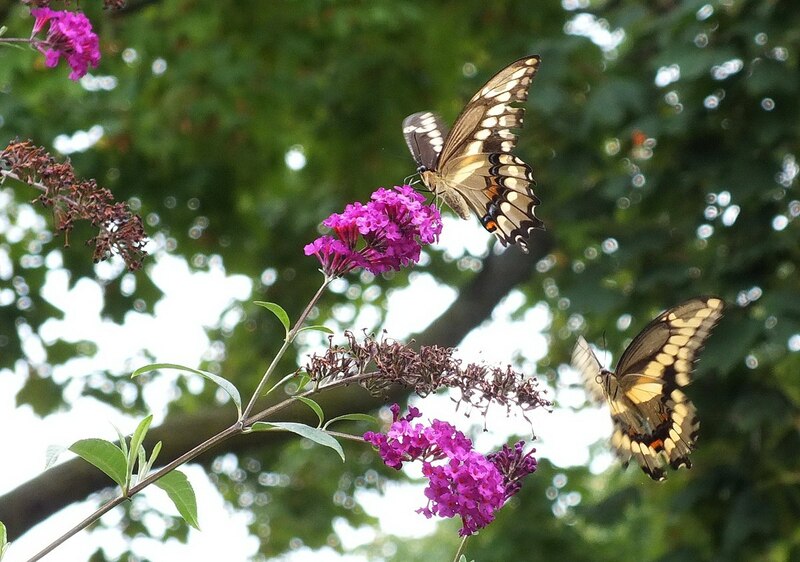 When Bob and I spotted a magnificent Giant Swallowtail partaking of the nectar, we rushed outside to witness this momentous event. 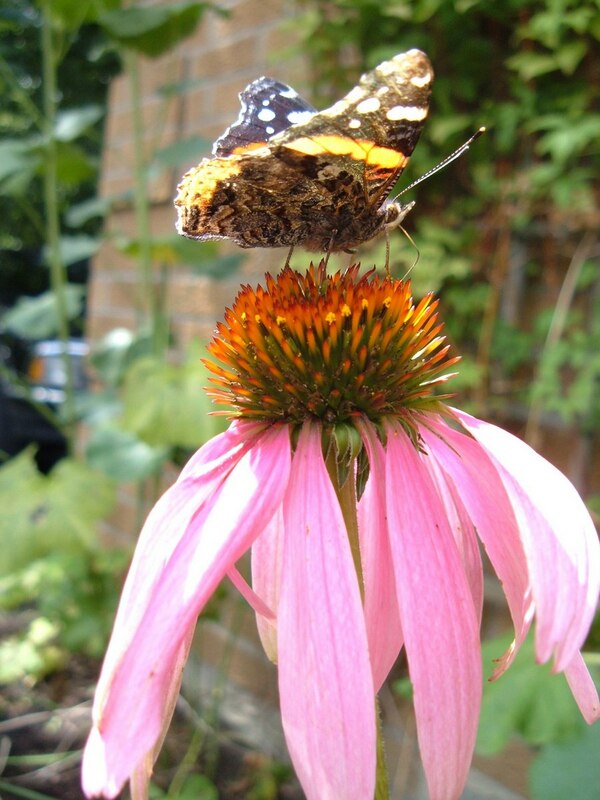 Never before had one of these, the largest butterflies in North America, visited my flowers in the past. 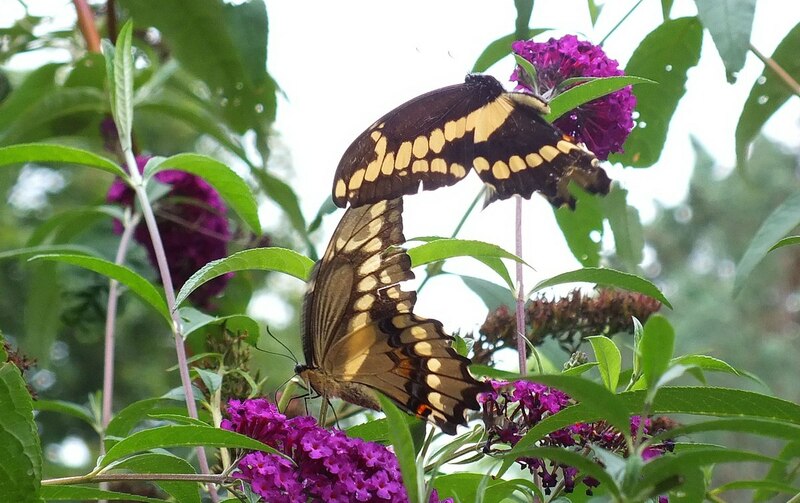 It turned out that a pair of the Giant Swallowtail Butterflies remained in constant close proximity to one another with one seeming to flutter in the air as the other lit on a flower head. 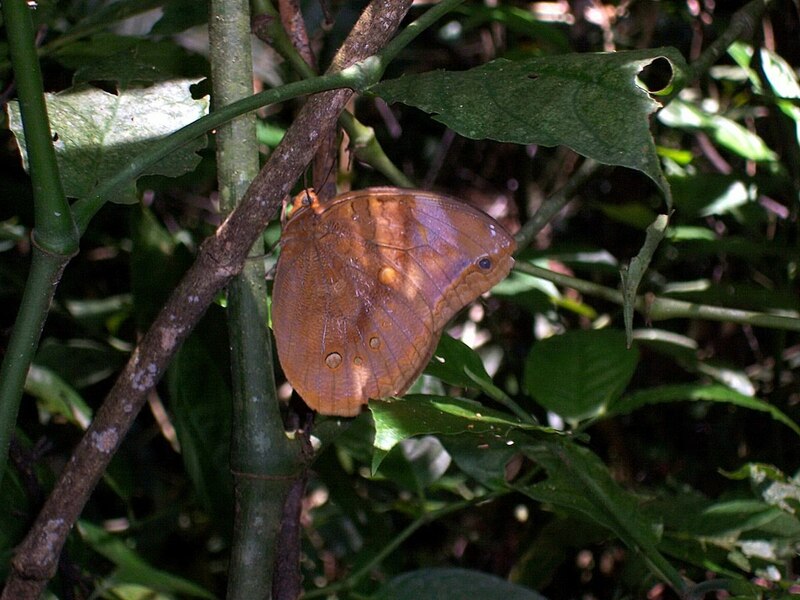 It was difficult to distinguish the male from the female because their movements were just a blur, but the female butterfly is always larger than the male. 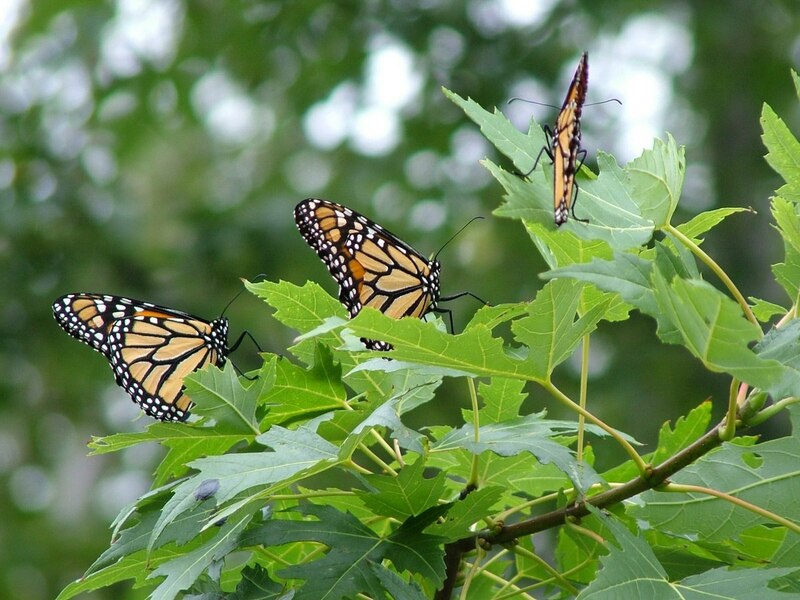 The range of these magnificent butterflies characteristically did not include the Toronto region, but they have been gaining a toehold here in recent years, perhaps because of climate change. With their boldly patterned black and yellow wings, that can be up to 7 inches across, they are a striking and welcome visitor to my garden. 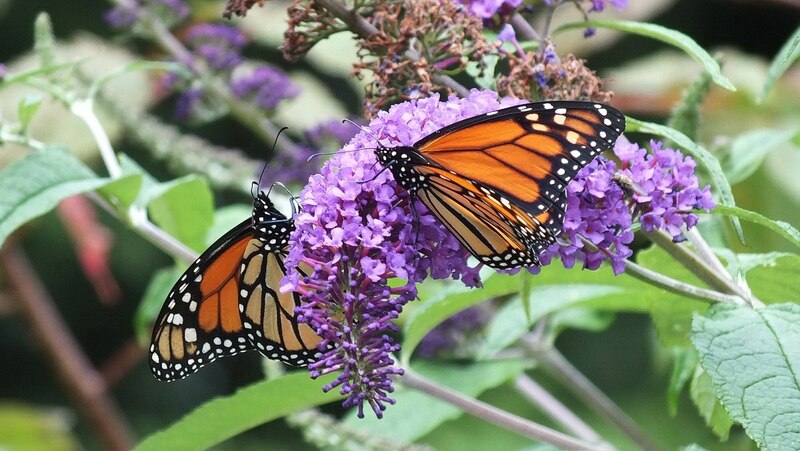 These two butterflies had most likely recently hatched into their winged adult phase, and were busily feeding on nectar and searching for a mate. The male butterfly danced in the air, circling the female non-stop during his courting flight, which created for Bob and me a fairy-like display that was most impressive. 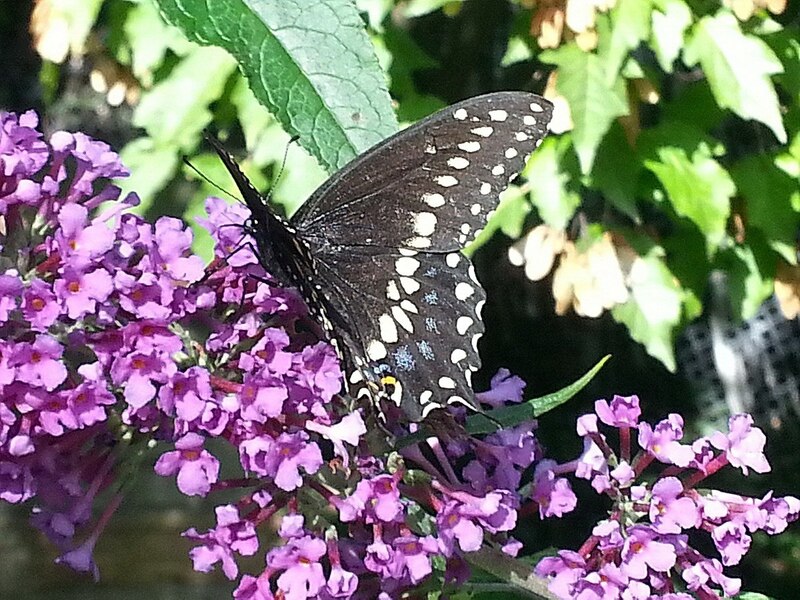 Another welcome visitor to my flower garden has been a Canadian Tiger Swallowtail Butterfly (Papilio canadensis). With its wingspan of over 3 inches, and the distinctive bold, black “tiger” stripes, this butterfly commands attention by even the most casual observer. 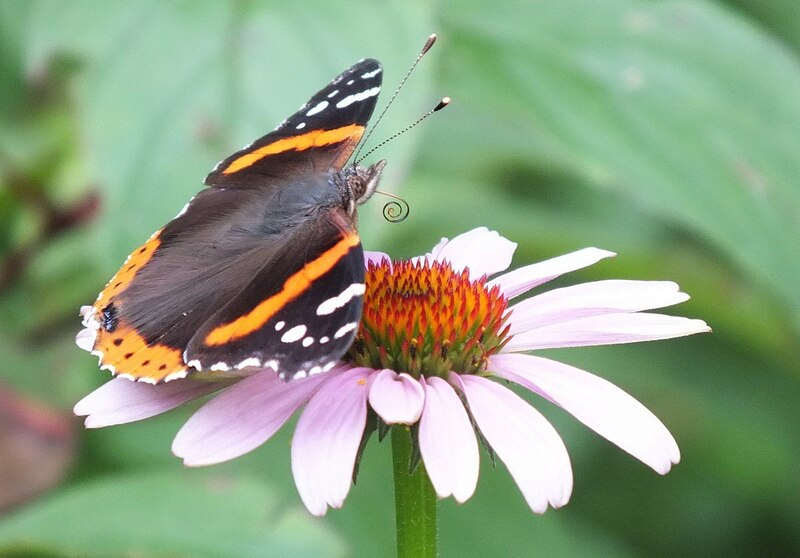 My garden plantings include Coneflowers (Echinacea purpurea) that are not really touted as plants that will attract butterflies, but this little Red Admiral Butterfly (Vanessa atalanta) had a different notion. 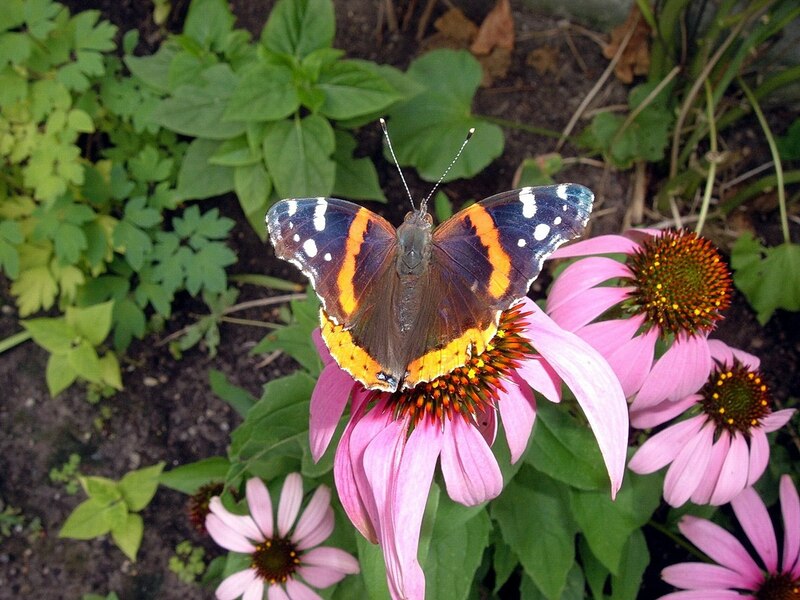 Red Admiral Butterflies are not resident in Toronto because they cannot survive freezing temperatures at any stage of their existence. Therefore, they do not overwinter in our region but are annual migrants. 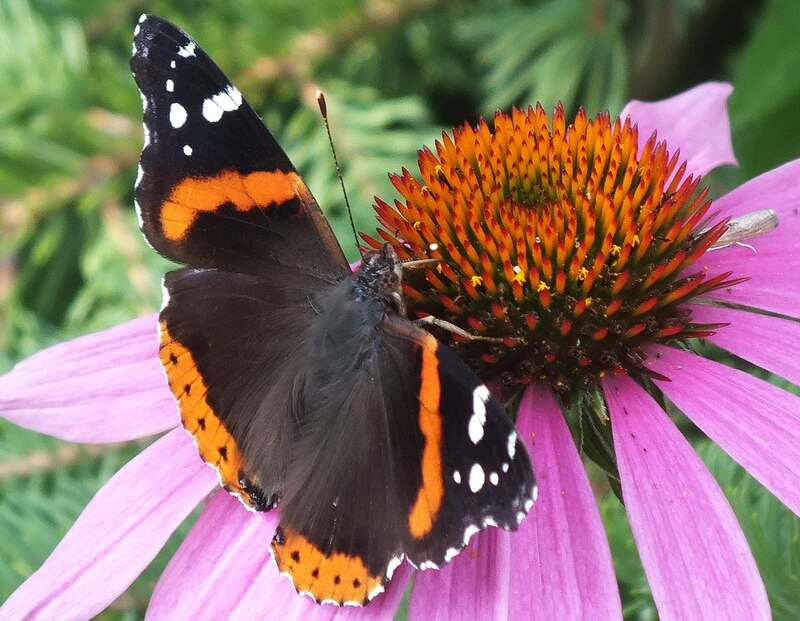 That is why, in late summer, Red Admiral Butterflies avidly feast on nectar from flowers to build their energy stores for migration to southern Texas. The bright red bands across the dark brown forward wings, in combination with the broad red bands edging the hind wings, absolutely glow when the butterflies are caught in a ray of sunshine. They are very striking regardless of their small stature. 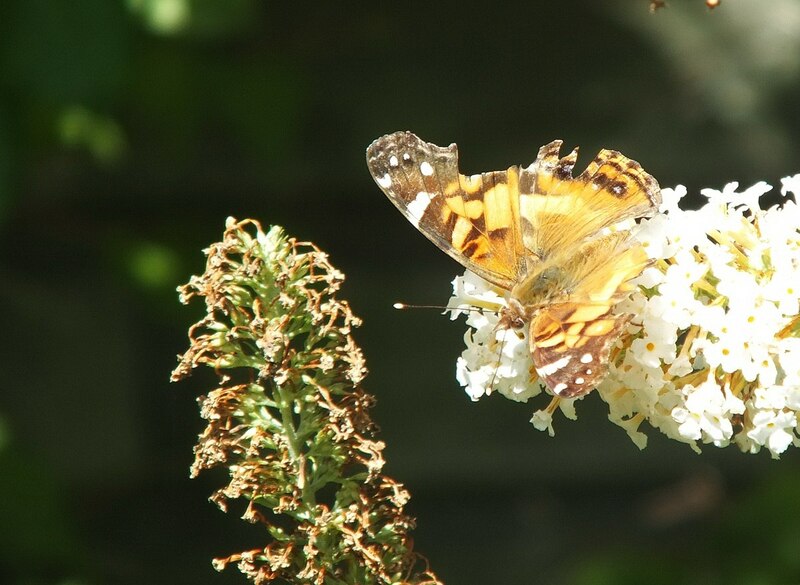 A Painted Lady Butterfly (Vanessa cardui) that visited my Butterfly Bush is of similar colouring as the Red Admiral, but is a little larger. It, too, is an annual migrant, with a completely new population arriving from the southwestern United States each spring. The adults do not return to the south in the fall but instead perish with the first killing frost. 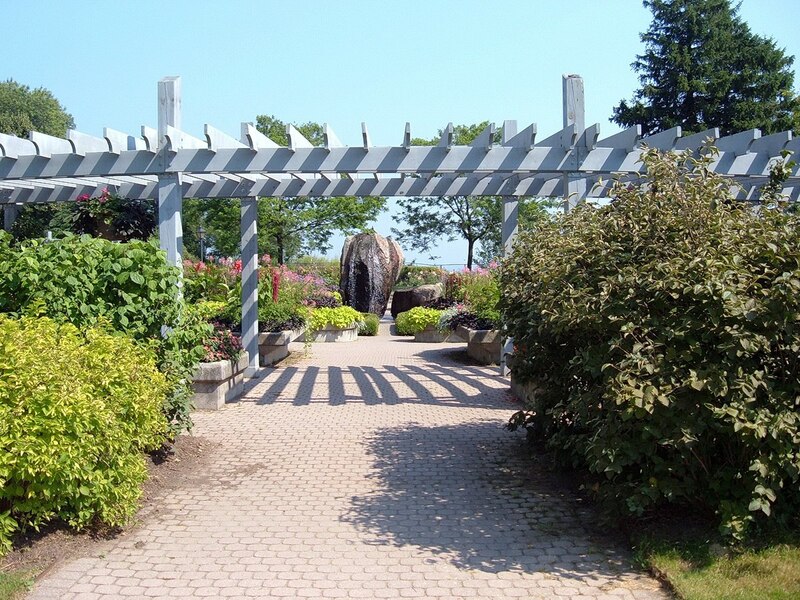 When Bob and I visited Rosetta McClain Gardens in south Scarborough, it was simply for an enjoyable walkabout the extensive gardens. Our first destination was the Rose Garden. 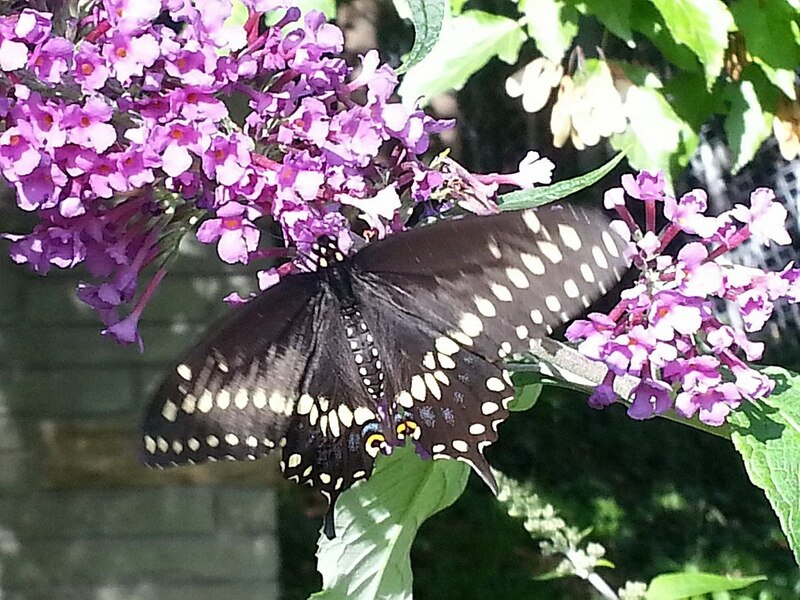 As always, we carry our camera gear with us, and it did not come amiss when we discovered this Black Swallowtail Butterfly (Papilio polyxenes) at rest on yet another Butterfly Bush. This is a male of the species, a resident of Toronto in that the caterpillars can be seen into autumn, and they safely overwinter as a chrysalis. 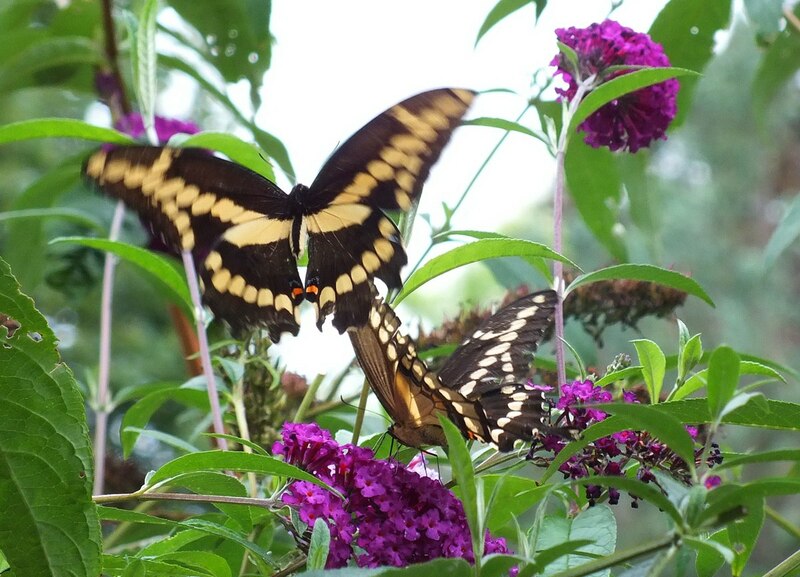 These are a fairly large butterfly with a wingspan of between 3-4 inches. 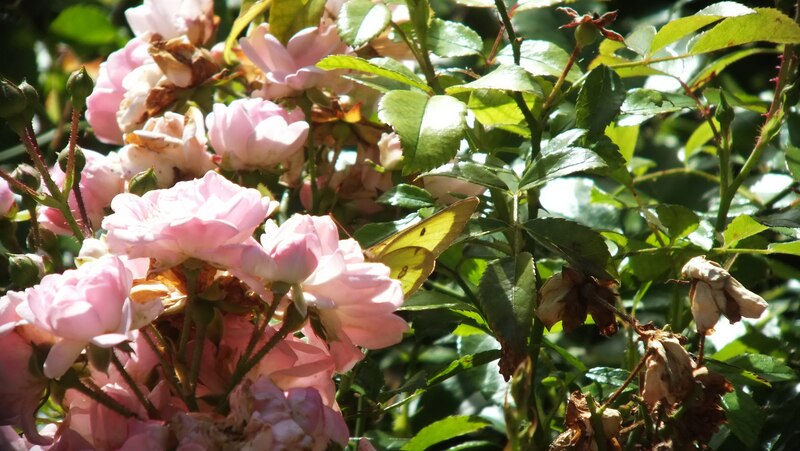 While we still circulated among the fragrant rose gardens, the air literally shimmered with dozens of little Cabbage White Butterflies (Pieris rapae). 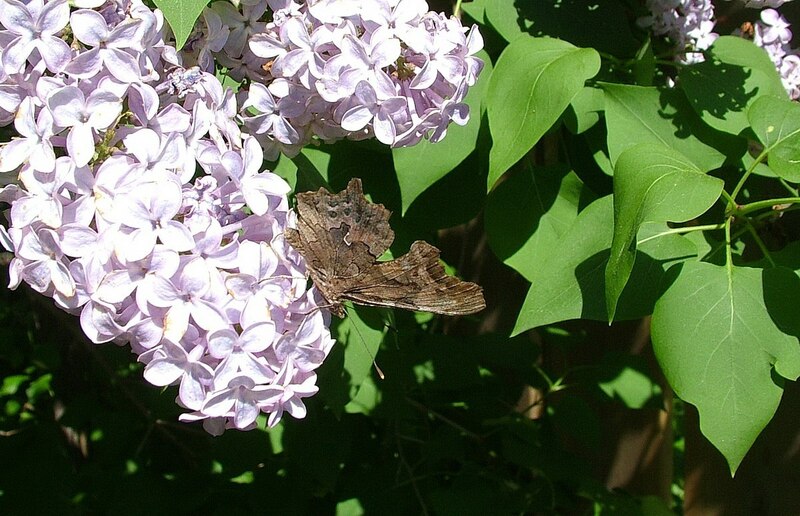 This butterfly is a non-native species that was accidentally introduced into Quebec around 1860. 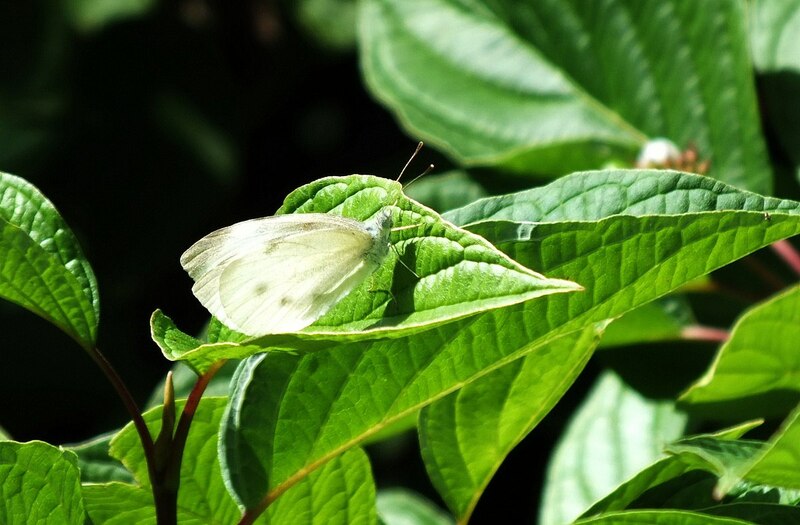 It may be the reason for the decline in numbers of our native Mustard White and Checkered White Butterflies. I had a hard time keeping up with the erratic flight of this Clouded Sulphur Butterfly (Colias philodice) as it first landed on a stalk of Obedient Plant, flitted upwards to a tall Coneflower, then ventured in amongst the rosebushes. 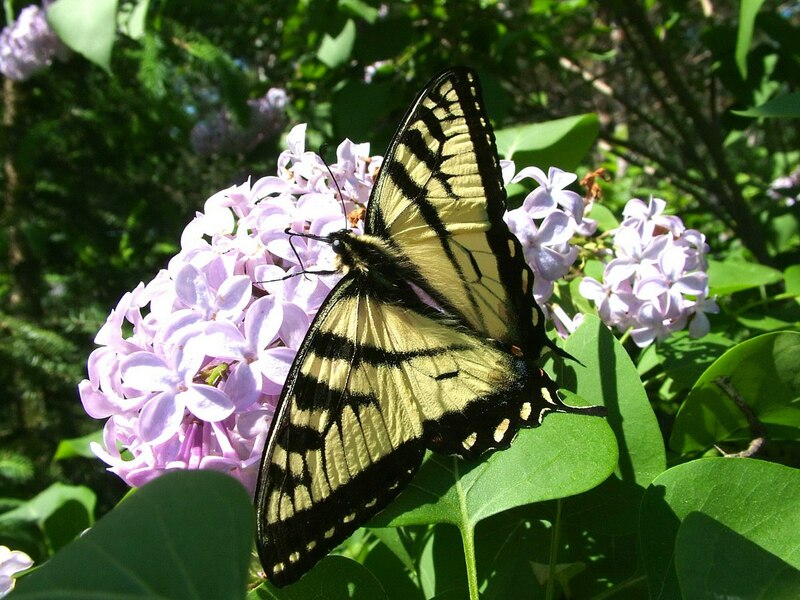 The bright yellow colour of this butterfly’s wings is believed to have been the inspiration for the word “butterfly” itself. And then we spotted a Monarch Butterfly (Danaus plexippus), an iconic species all to itself. It is probably the world’s most familiar butterfly, made so by their amazing mass migration from North America to the mountains of central Mexico. 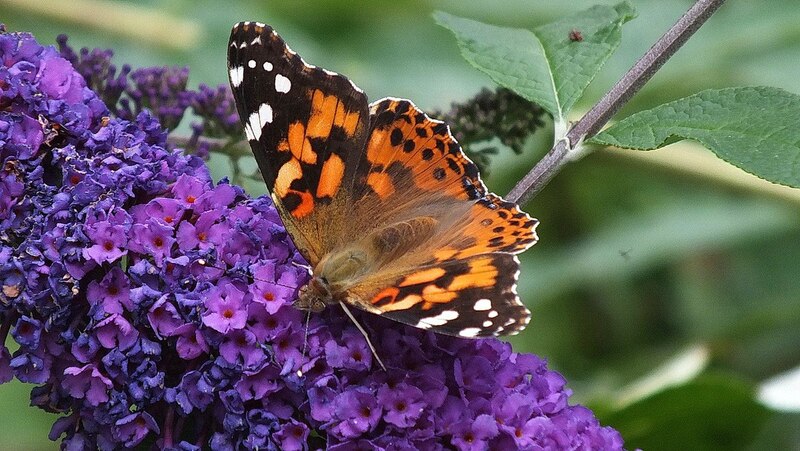 Over the years, more of these butterflies have visited my gardens than all the others combined. 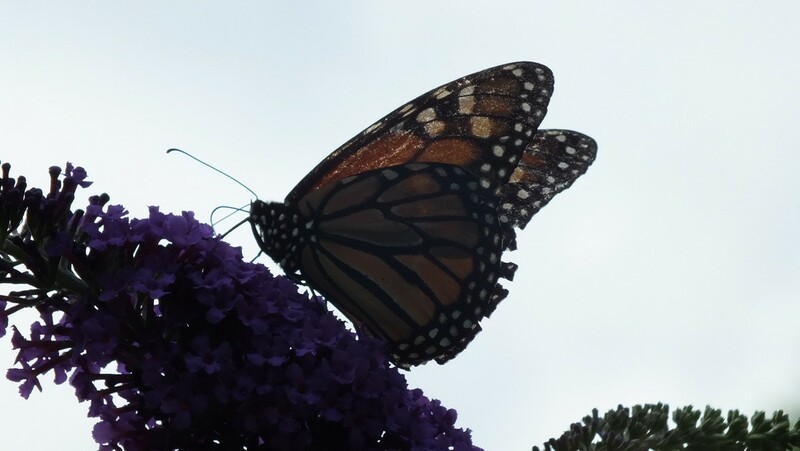 Most years, Monarch Butterflies are a very common sight on my Butterfly Bushes, especially during the latter part of the summer when late-emerging adults indulge in a feeding frenzy to build up nourishment for the very long migratory flight, 4,000 kilometres to the Monarch Butterfly Biosphere Reserve. 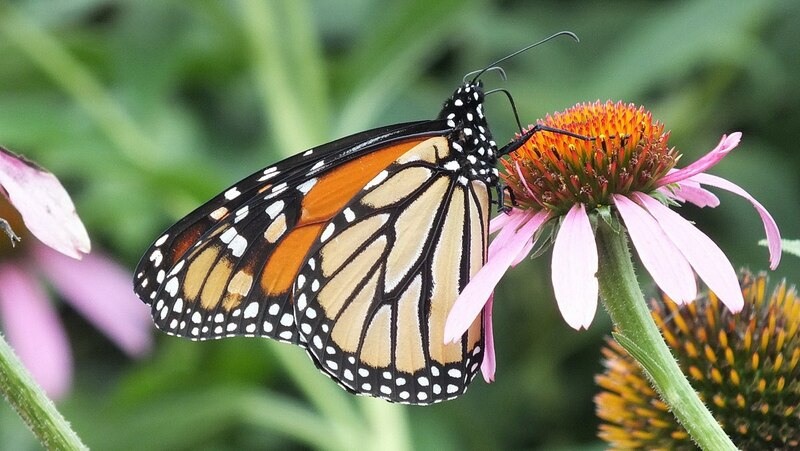 This year has seen a sharp decline in the numbers of Monarch Butterflies, and the causes have been widely discussed…everything from loss of habitat in Mexico, the use of herbicides on crops in the U.S., which inevitably kill the milkweed plants on which the butterflies depend, the long-lasting drought in the States that has caused the die-off of wildflowers, and the exceptionally cold, wet spring we experienced here in Canada. I estimate that only about a dozen of these beautiful orange and black winged beauties have been seen on my own property this summer, whereas normally there would be dozens. 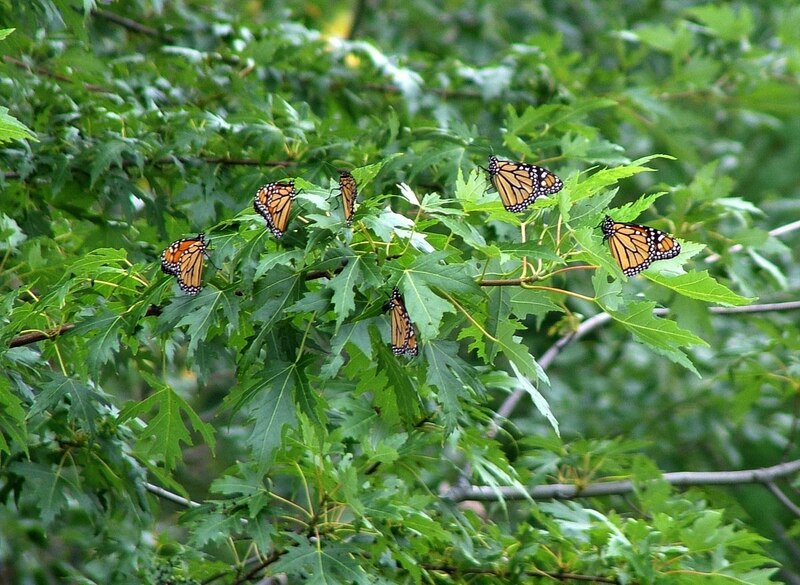 One time, a couple of years ago, when Monarch Butterfly populations were at more normal levels, Bob and I were thrilled to discover a “flutter” of Monarchs resting amongst the leaves of a deciduous tree at Milliken Park in north Scarborough. It was late one afternoon towards the end of summer, so the butterflies were beginning to gather together for their mass migration. They had chosen to cluster on the sheltering tree for the night before continuing further south. 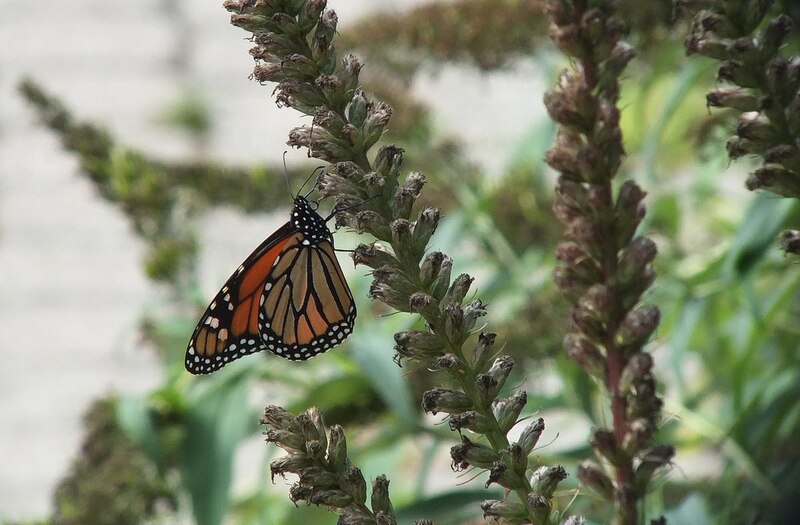 Even though Bob and I have heard of “rivers” of Monarchs at the Lake Ontario waterfront during butterfly migration, we had never before seen so many of these stunning insects in one spot at one time. It was a real thrill. 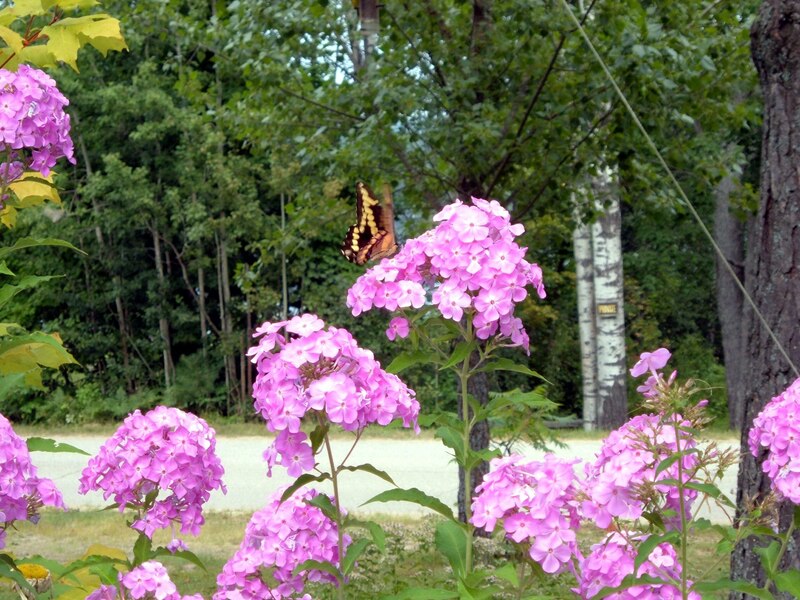 My fascination with butterflies goes back a long ways, to the days of my childhood at Oxtongue Lake. 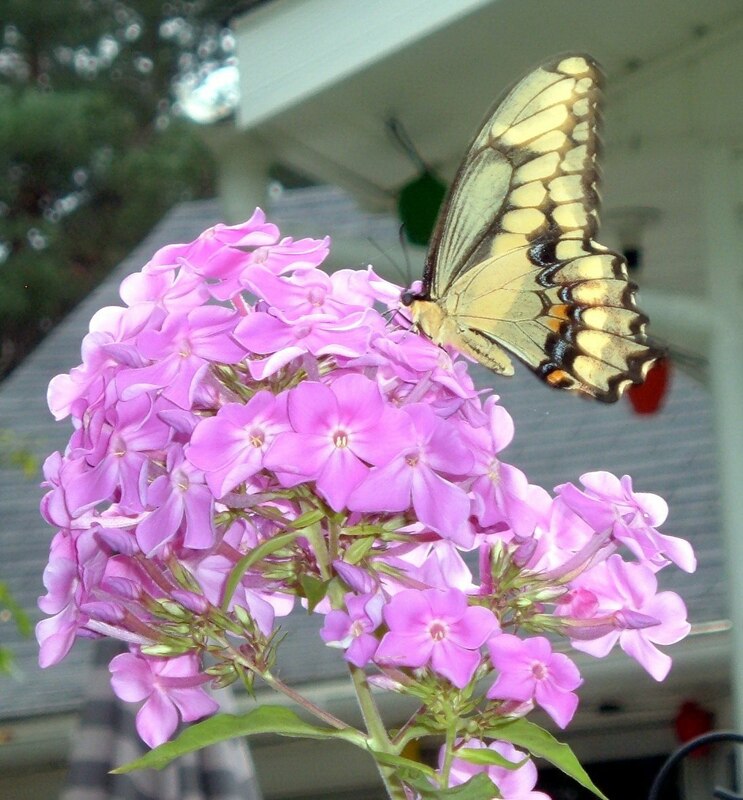 My parents nurtured a beautiful array of flowering plants during the short summer months, and various butterflies would visit the vibrant blooms. 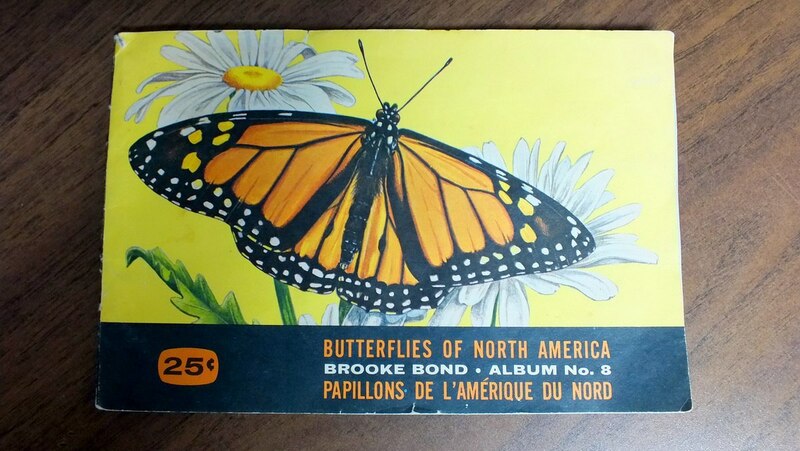 At that time, the Red Rose Tea Company used to include in some of their products collectible cards with photos and details about the Butterflies of North America. I faithfully collected the cards and then mounted them in this album. Although I never caught and mounted real butterflies, their fanciful colours and delicate wings routinely captured my interest. even an Eastern Comma Butterfly (Polygonia comma). 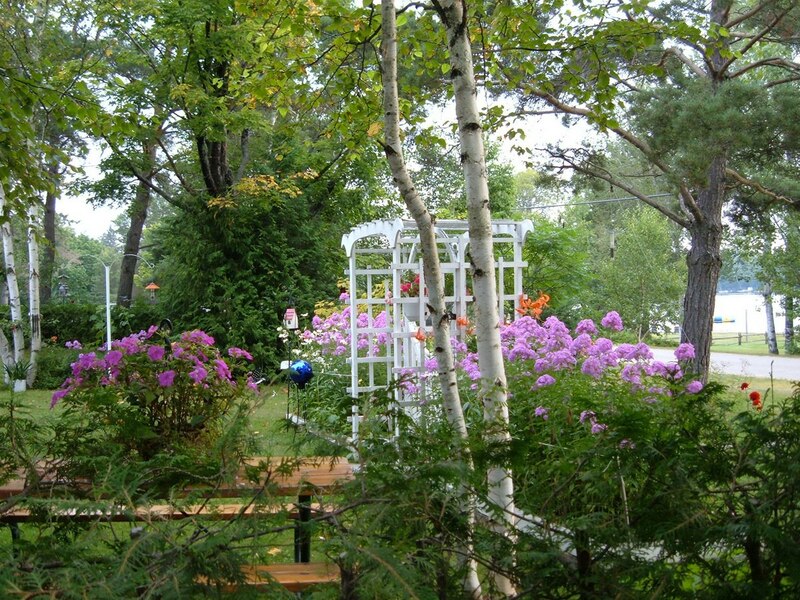 My dad’s gardens stand out like an oasis of blooms amidst the conifers and deciduous trees that border his property on Oxtongue Lake. 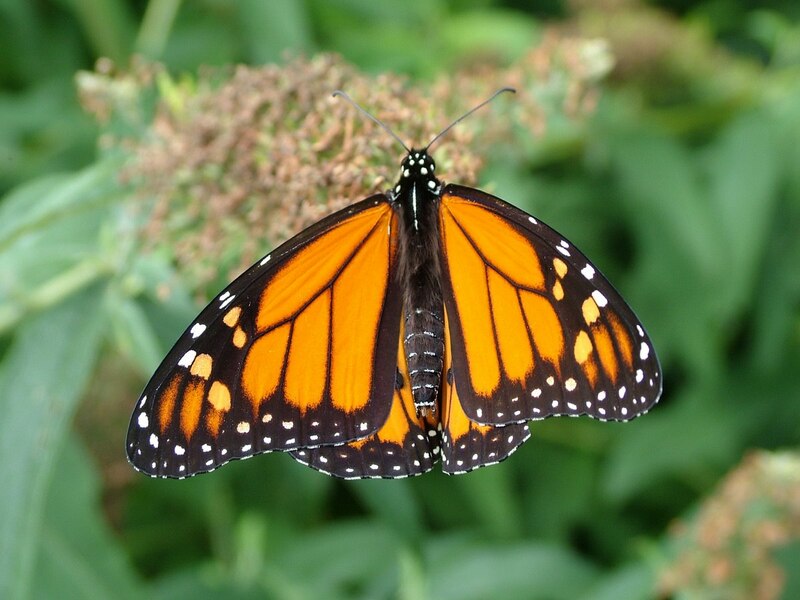 It goes without saying that Monarch Butterflies are the most prevalent species of butterfly to be seen at Oxtongue Lake, given the vast fields of milkweed that abound in the surrounding area. 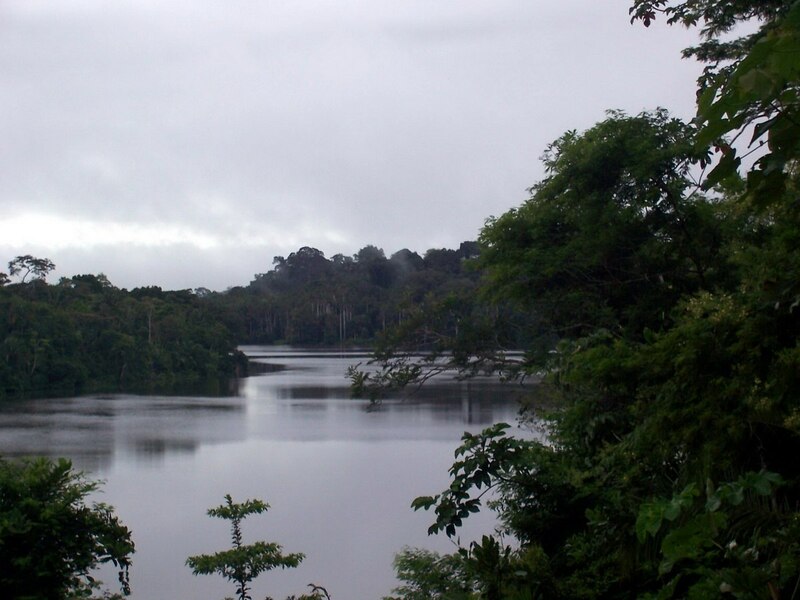 A little further afield, in the national reserve near Sandoval Lake, Peru, in the Amazon Basin, Bob and I fostered our interest in the insect world, and took note of several different species of butterfly. Identifying them has been nearly impossible given the 2,500 species that are known to exist there, and given that a large portion of them remain unidentified. 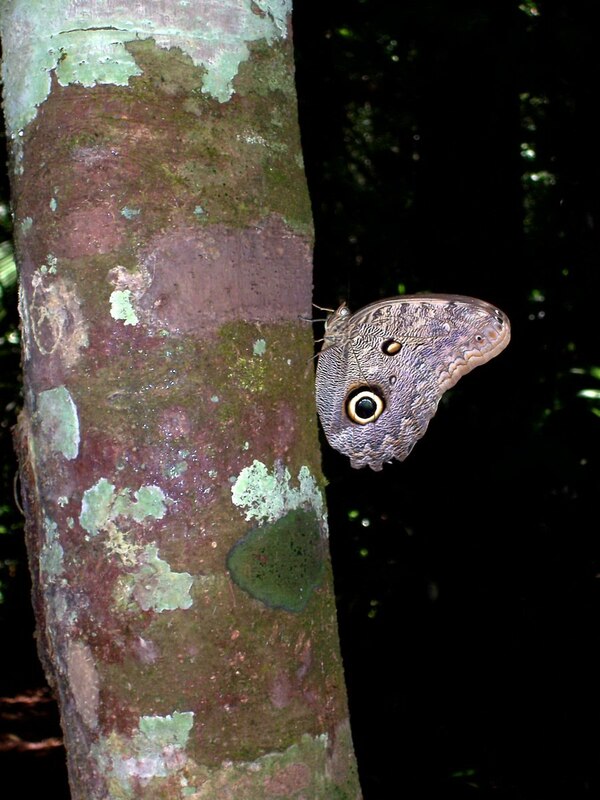 On one afternoon, with our personal guide, we walked through the rainforest near Sandoval Lake Lodge and were pleased to spot this Owl Butterfly of the genus Caligo. There are over 20 species of owl butterfly within this genus, so positive identification has eluded me despite contact with a couple of Peruvian insect specialists. Owl Butterflies are so named because their wings have huge eye spots that resemble an owl’s eyes. With such large wings, up to 8 inches, Owl Butterflies fly only short distances at a time. For this reason, they prefer to fly at dusk when fewer avian predators are active. 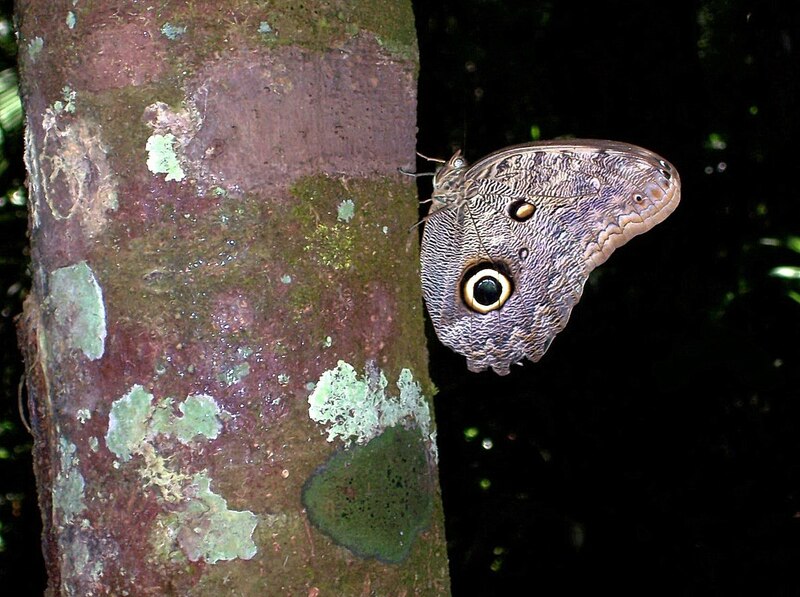 On the same exploratory walk through the deep jungle, another butterfly, or perhaps a moth, caught our eye. A brief rain shower had dampened the canopy, so you can see drops of water on the insect’s wing. Although Jeff, one of my contacts in Peru, said it was a nice looking lepidoptera, he was unable to identify it for me. 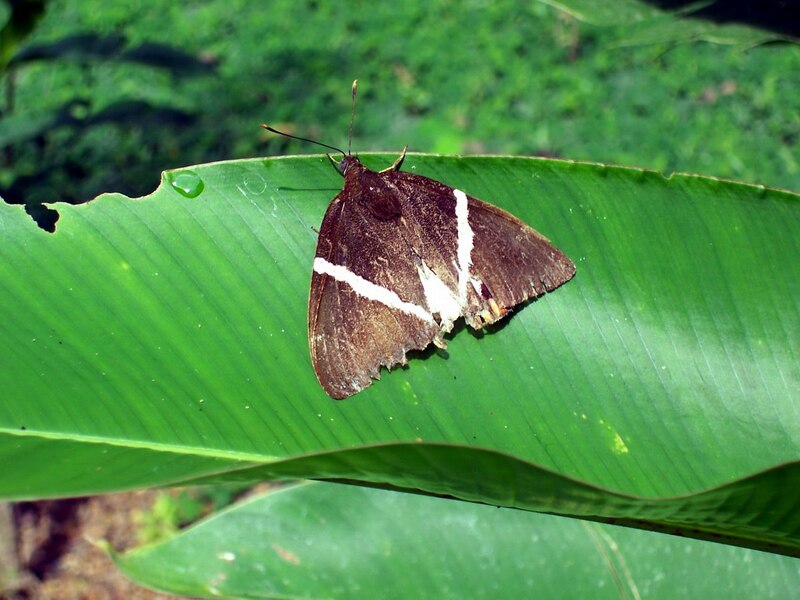 This striking example of lepidoptera was similarly drying its wings, and Jeff explained that “there are so many species, no field guides and so few experts” that a good share of the butterflies and moths in the Peruvian jungles remain unnamed. When it was time to take our leave of Sandoval Lake Lodge, a 3-kilometer trek through the muddy jungle provided ample opportunities to study native plants and animals. One of the highlights that day was when we saw a Blue Morpho Butterfly (Morpho peleides). 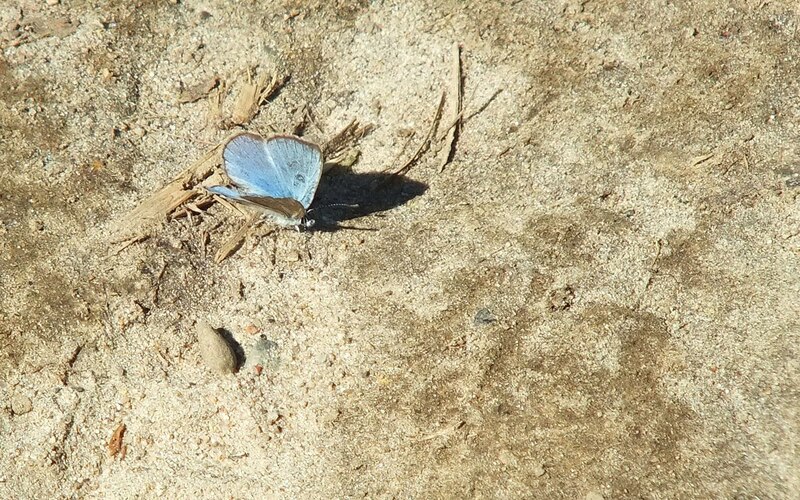 Its brilliant blue wings shimmer because of tiny scales on the wings that reflect the sunlight. 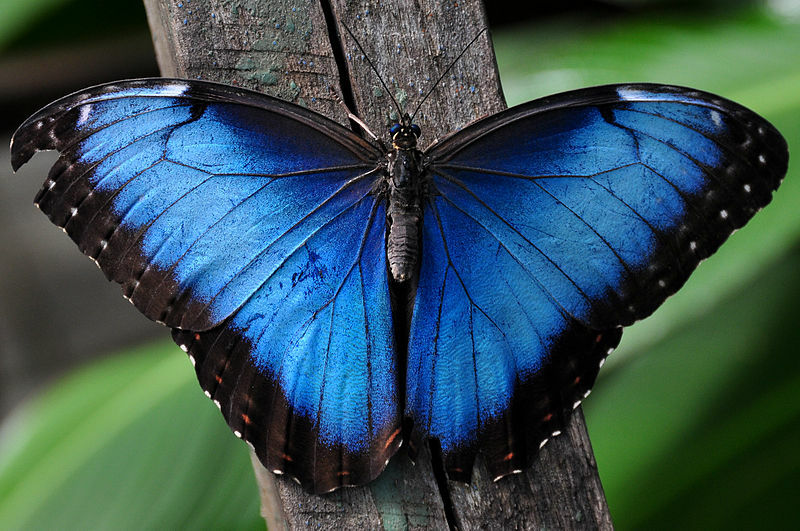 The Blue Morpho Butterfly is among the largest in the world with a wingspan close to 8 inches, and we were indeed very, very lucky to see it. 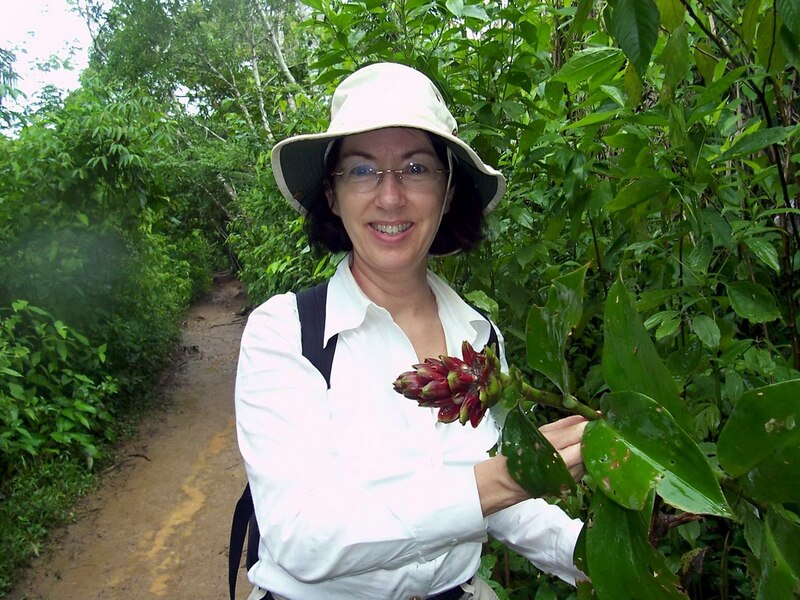 But one does not have to travel all the way to Peru to enjoy observing butterflies. 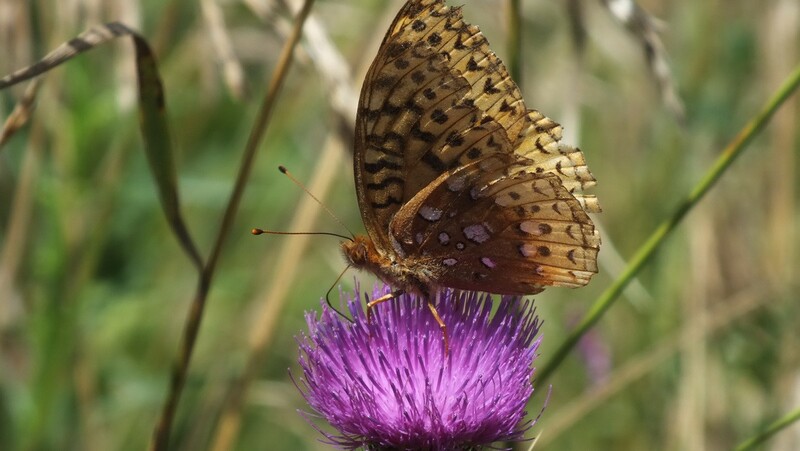 On a recent bicycle excursion near Little Britain, Ontario, Bob spotted this Great Spangled Fritillary Butterfly ((Speyeria cybele). A small patch of Canada Thistle, with blooms that would soon be spilling seeds, held the butterfly’s interest beside the bicycle trail. 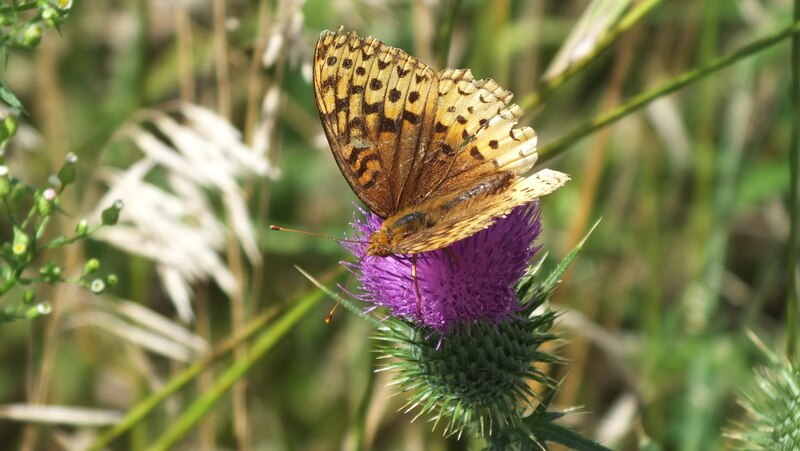 This sparkling beauty exhibits the typical orange and black fritillary pattern on the upper sides of the wings, while the undersides of the wings are heavily spangled with silver. Typically, the females are a darker orange than the males. It is a wonder that my own garden isn’t overrun with Great Spangled Fritillary butterflies because they lay their eggs on or near violets, and I have rows of spring-blooming violets along my walkway. The caterpillars hatch in the fall and overwinter until spring when they feast on young violet leaves. If I want to catch them eating, I will have to go out under the cover of darkness, with flashlight in hand, as that is when they eat. Otherwise, I might find the caterpillars hiding under the leaves during the day. 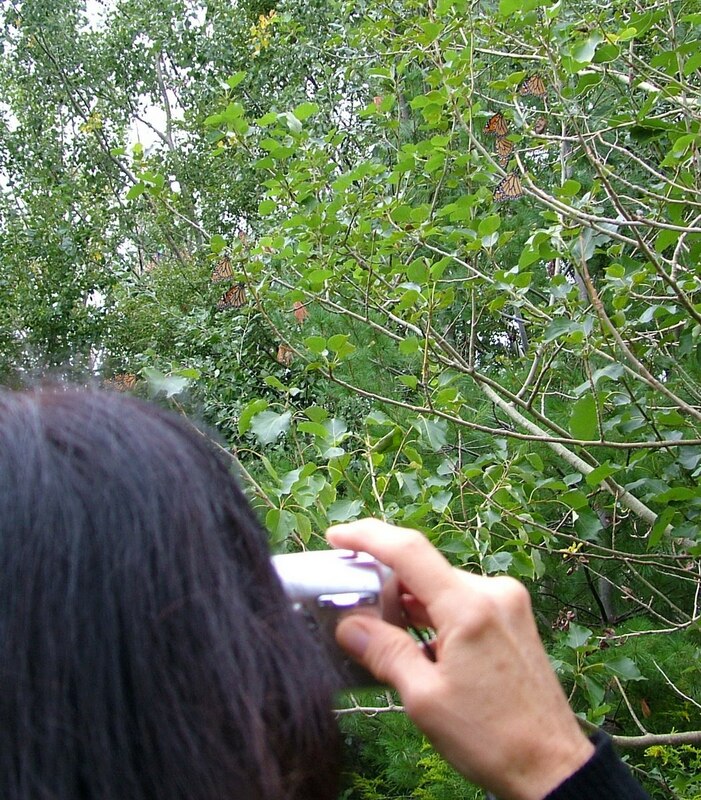 The summer months offer ample opportunities for bird and butterfly observations, and on a hike to Forks of the Credit Provincial Park, in Ontario, we enjoyed viewing many types of birds and also a first-time sighting of a couple of interesting butterflies. 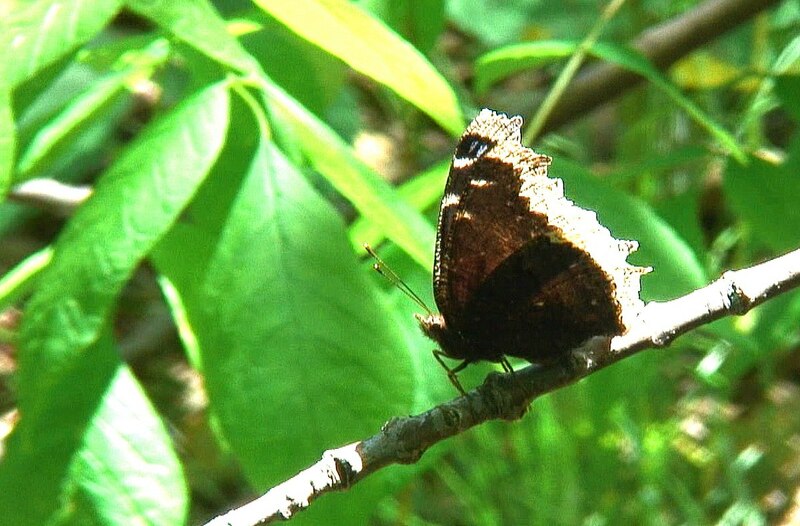 As we walked along a section of the Bruce Trail, a Mourning Cloak Butterfly (Nymphalis antiopa) entered the open area of the sunny trail from within the deeply-shaded valley bordering the Credit River. 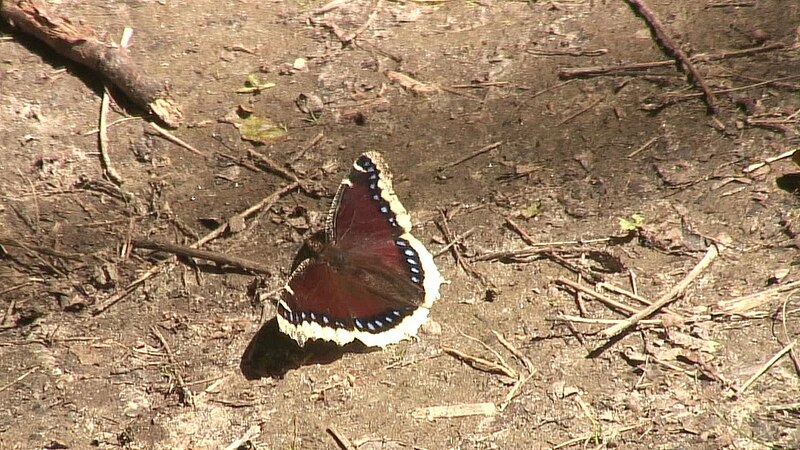 Mourning Cloak Butterflies are one of the species that overwinter in Ontario as adults, albeit in a state of dormancy. 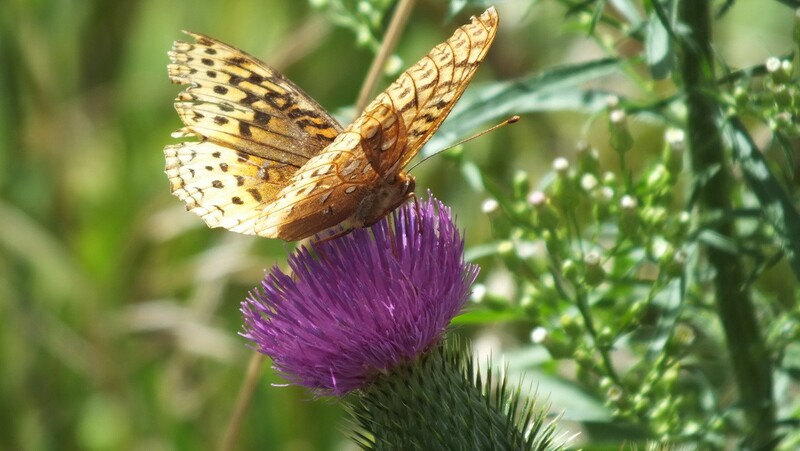 We have often seen butterflies sitting on the warm earth soaking up the sun, but they could also be getting much-needed minerals from the soil. Male butterflies need the minerals in order to develop sperm. 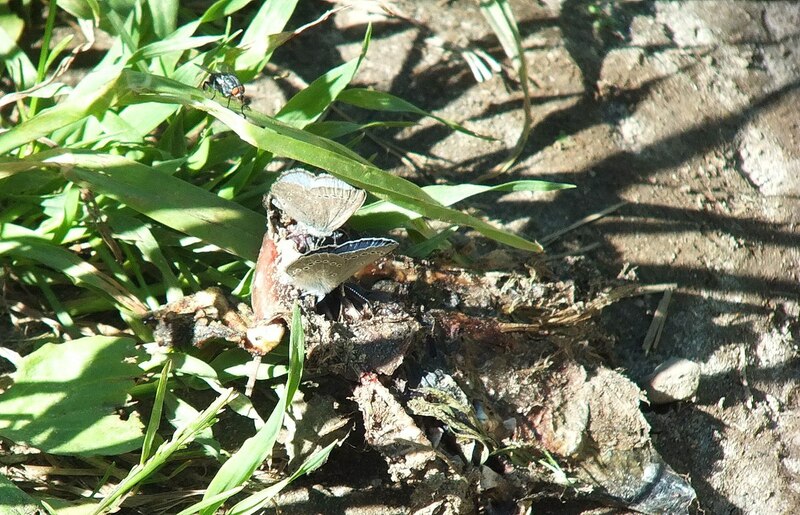 When a group of butterflies sits on mud or dirt, they are said to be “puddling”. 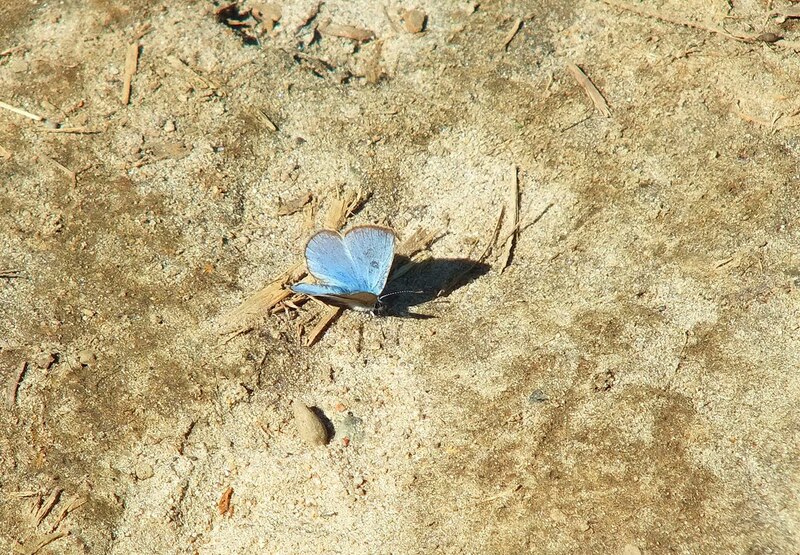 Further along the trail system at Forks of the Credit Provincial Park, on the Meadow Trail, numerous Silvery Blue Butterflies (Glaucopsyche lygdamus) were doing the same thing. These tiny butterflies are recent newcomers to the Toronto area, arriving here in 1992 from central and eastern Ontario. These little gems prefer a meadow habitat provided that cow vetch constitutes a large share of the vegetation because each year’s single brood of caterpillars eats the flowers of that plant, while the adults feed on the nectar. Once the eggs reach the pupal stage, they remain that way until the following spring. When looking at the ventral view of the wings, it is possible to see the distinctive pattern of white-rimmed black spots that nicely set off the pale grey of the undersides of the wings. 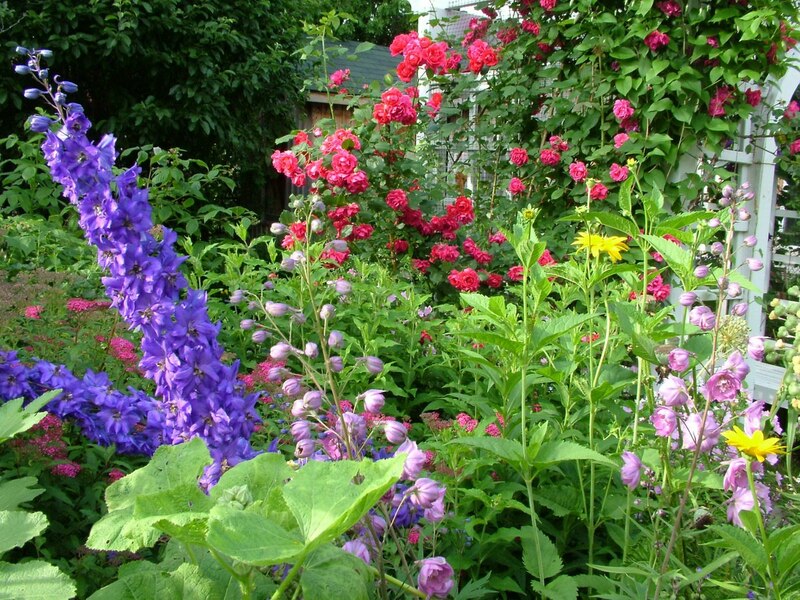 So, while I love my own flower garden and the bevy of birds and butterflies that grace it with their presence, there is definitely a benefit to exploring habitats that offer different vegetation and therefore attract a wider variety of species. It wouldn’t be fitting to talk about butterflies without mentioning the wear and tear that they suffer from their hard-working existence. 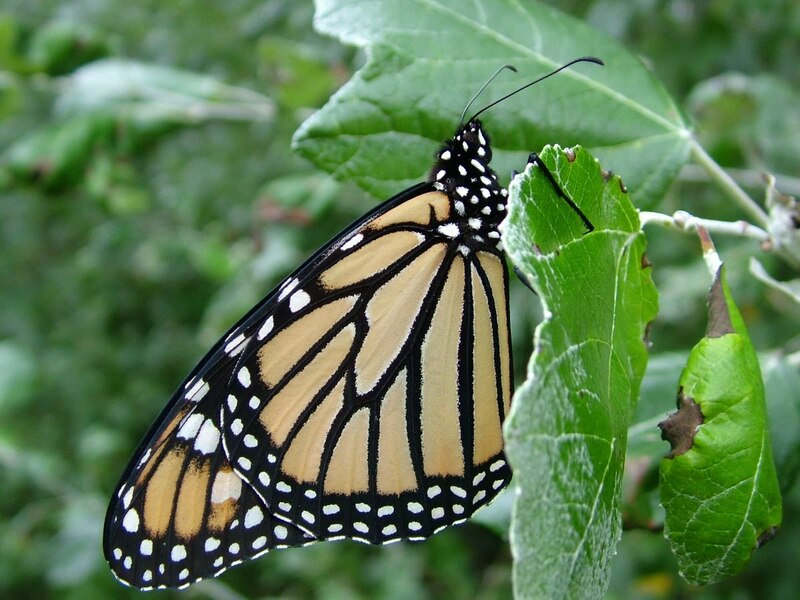 It is hard to believe that this Monarch’s gossamer wings can still manage to carry it thousands of kilometres, whisk it to safety, and enable it to perform routine tasks. It is a wonder that this American Lady Butterfly can still manage to function with such frayed wings that are even missing large chunks. Some butterflies are capable of flying while missing a wing; now that is what I call tenacious. I can only hope that next year, and in years to come, their numbers make a comeback. One day, I would love to travel to Mexico to see the spectacle of millions of these incredible insects amassed for their winter hibernation. That would be one awesome sight. 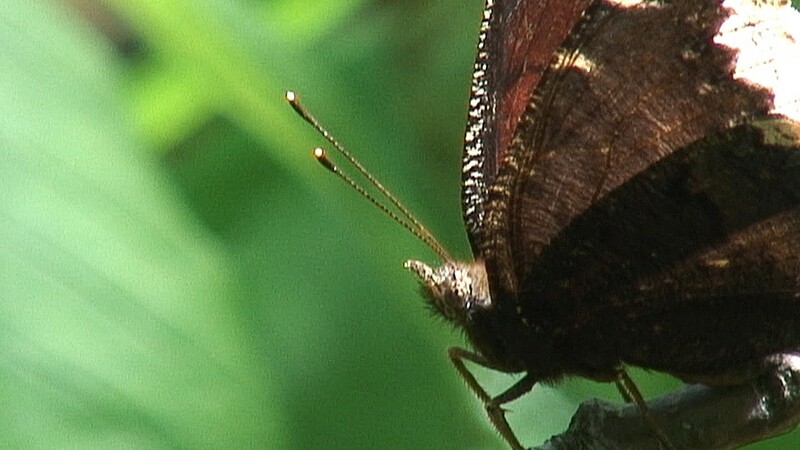 In the meantime, I’ll have to suffice with a viewing of the movie, Flight of the Butterflies. I hear it is breath-taking. 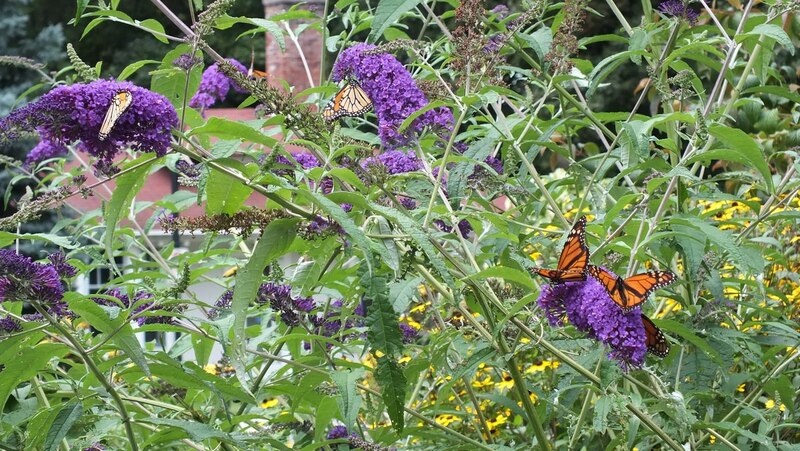 I have the beginnings of a butterfly garden in Halifax and hope to emulate members of the Blomidon Naturalists’ Club in Wolfville who have established an official Monarch Waystation. I visted them last July and it was a revelation to see the work they are doing to help this endangered species. 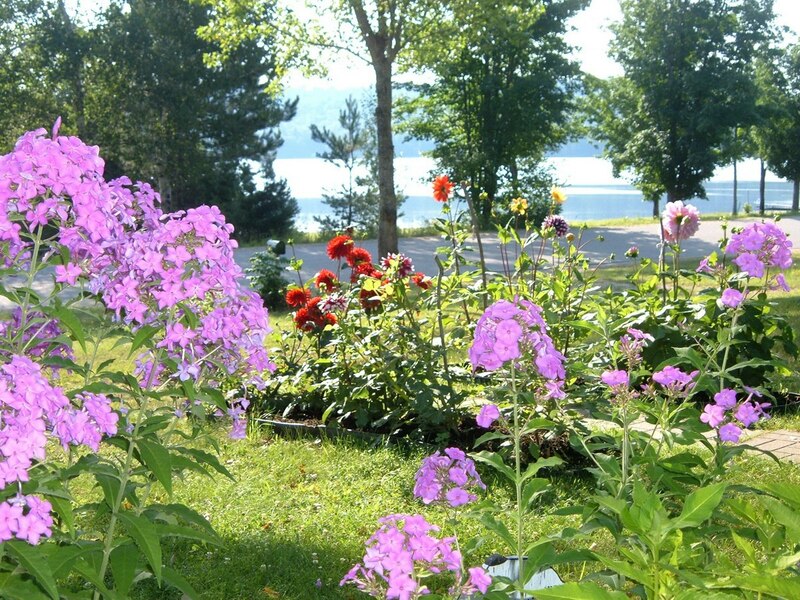 Was intrigued by your reference to Oxtongue Lake (if it’s the one near Dwight, that’s where my son now lives) and the tea cards (they did birds too) as I was also a collector years ago. You sound to be living a perfect life – good for you! thank you for contacting us, Eleanor. How interesting to learn that your son lives in my neck of the woods. 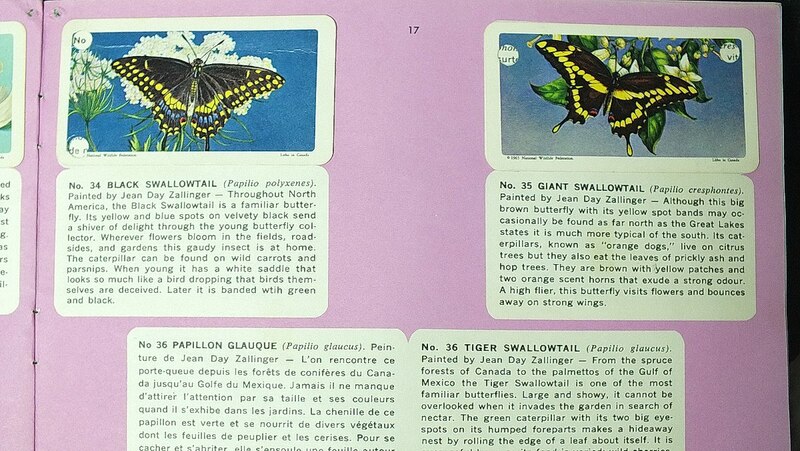 Regarding the tea cards, I also have a booklet assembled back then of wild flowers but never collected those of birds. That would be nice to have. Our life is not perfect, but we are doing our best to enjoy it along the way.